The following lecture is devoted to talk about Preterm Labour. 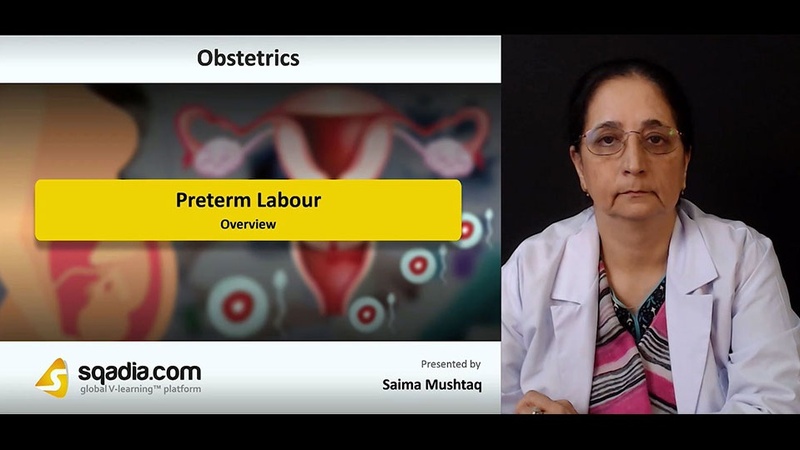 Section one is dedicated to put forth an Overview of the Preterm labour. Firstly, the educator has discussed the term Preterm Labour followed by its Aetiology. Moving forward, the educator has laid stress on the Epidemiology of this condition. The educator has then concluded this section by discussing about Endocrinology and Biochemistry of Labour. Section two lays stress on the Onset of Labour. After having conversed about the term, Onset of Labour, the educator has shed light on how Progesterone maintains Uterine Quiescence. Following this, the educator has extensively talked spoken about Labour as an Inflammatory Process. In the end of this section, the educator has presented the Role of Oxytocin and Role of Prostaglandins inclusively. The prime focus of section three is the Causes of Preterm Labour. In the beginning, the educator has outlined the Causes of Preterm Labour. In addition to this, the educator has talked over Cervical Weakness as one of the origin, followed subsequently by Infection. Apart from this, the educator speaks about Multiple Pregnancy and Uterine Distension along with Uterine Müllerian Anomalies. In the end of this section, the educator has delineated about Haemorrhage and Stress as causative factors for Preterm labour. Section four accommodates Management of Preterm labour. Firstly, the educator has elucidated about Beta-Sympathomimetics followed by discussion on Magnesium Sulphate and Non-Steroidal Anti-Inflammatory Drugs. Afterwards, the educator has explained about Calcium Channel Blockers and Oxytocin Receptor Antagonists. Moreover, Corticosteroid Therapy and Antibiotics have also been elaborated. Conclusively, Management of PPROM have also been laid stressed on by the educator. The focal point of section five is the Prediction and Prevention of Preterm labour. The educator has started off by talking about Past Obstetric History succeeded by Ultrasound Measurement of Cervical Length. Moving forward, the educator has thoroughly spoken about Prevention of Preterm Delivery. Furthermore, light has also been shed on a condition entitled Cervical Cerclage. In the end, the educator has exquisitely summed up the lecture under separate head Conclusion.